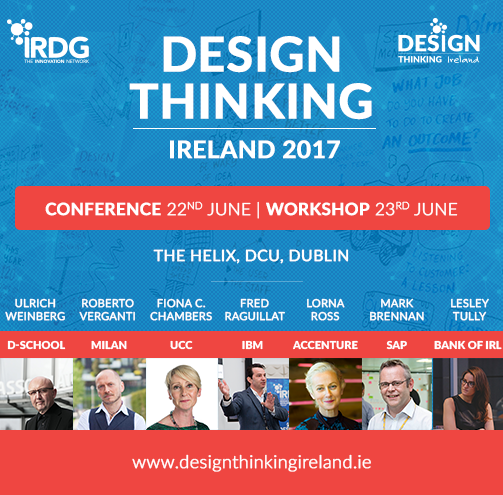 Design Thinking Ireland 2017 brings together leading experts and practitioners from Europe and Ireland to share with you the What, Why and How of Design Thinking. With our complete line-up of highly impressive speakers, it’s a unique event on the calendar for business leaders and champions of innovation in public and private sectors, across all industries. Whether you are wondering what it is all about, or already on a DT journey in your business, this conference will be an inspiration! Human-Centred Design is a creative approach to problem solving which starts with the people you’re designing for and ends with new solutions that are tailor made to suit their needs. In so doing, Design Thinking breaks your preconceptions of what a good innovation or solution would be and unleashes new undiscovered possibilities. It is both a process and a mindset, and when applied in daily work, has proven it’s potential to deliver significant business results. IRDG has been championing Design Thinking for many years, and we are thrilled to bring together such an amazing line-up this year.